What they're saying: Would trading for Le'Veon Bell make sense? 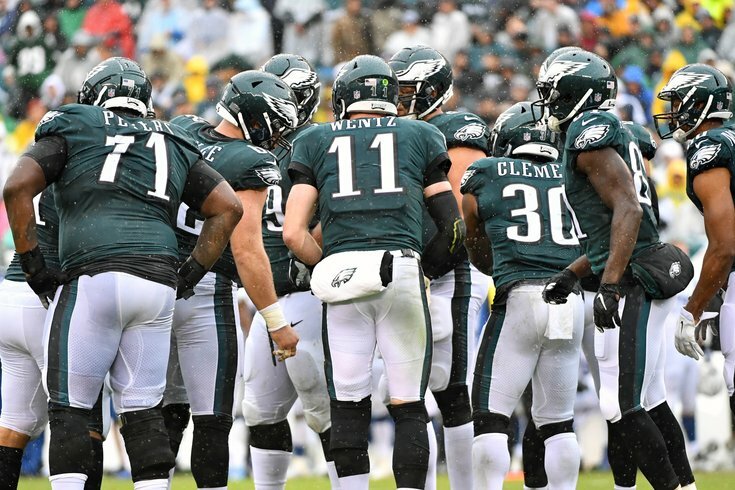 The Eagles' average field position is their own 23-yard line, which ranks 30th in the NFL. They have scored a TD or FG on 28.6 percent of their drives, which ranks 25th in the NFL, something they ranked seventh in last season. JimmySays: Hm, I didn't realize that stat, but it makes sense. The Eagles' special teams return units have not been good. The world champs are back up, but this time with more staying power. Carson Wentz wasn't flawless in the Eagles' 20-16 win over the Colts. His presence was more than felt, however, and the rest of the league should take notice. My colleague Judy Battista certainly did, embarking on a deep dive of Wentz's first action -- and first drive -- post-knee surgery. Also remember that the almost-2017 MVP was leading an offense sans Alshon Jeffery, Jay Ajayi and Darren Sproles. Look out next week, everybody. JimmySays: ...and Mike Wallace, and Mack Hollins. Carson Wentz on pace to win every start of 2018, though it's unclear if that will extend to 2019 and a successful title defense. JimmySays: USA Today did a full "on pace for" theme for every team, and I guess they just phoned this one in. For a first game back, that was just fine for Carson Wentz. He went 25-of-37 for 255 yards, one touchdown and one interception. He moved around well and the Eagles have to feel like it will only get better. “Overall I thought he did some nice things, extended some drives for us whether he was running escaping the pocket or making plays downfield,” Eagles coach Doug Pederson said, according to Philly.com. JimmySays: Wentz was just OK, in my opinion. Personally, I thought he was going to be better than he was, based on what I saw from him in training camp. Never underestimate "the speed of the game" in the regular season, I suppose. He'll be great again soon. Carson Wentz's return was a bit rusty, but he did enough to help the Eagles grind out a victory. Things will only get better as they get healthier, namely Jay Ajayi and Alshon Jeffery. JimmySays: The Panthers are ranked higher than the Eagles here, which is a little puzzling. Carson Wentz's return wasn't great, but it wasn't terrible, either. The Eagles won Sunday with Wentz back at QB and he should only get better from here.